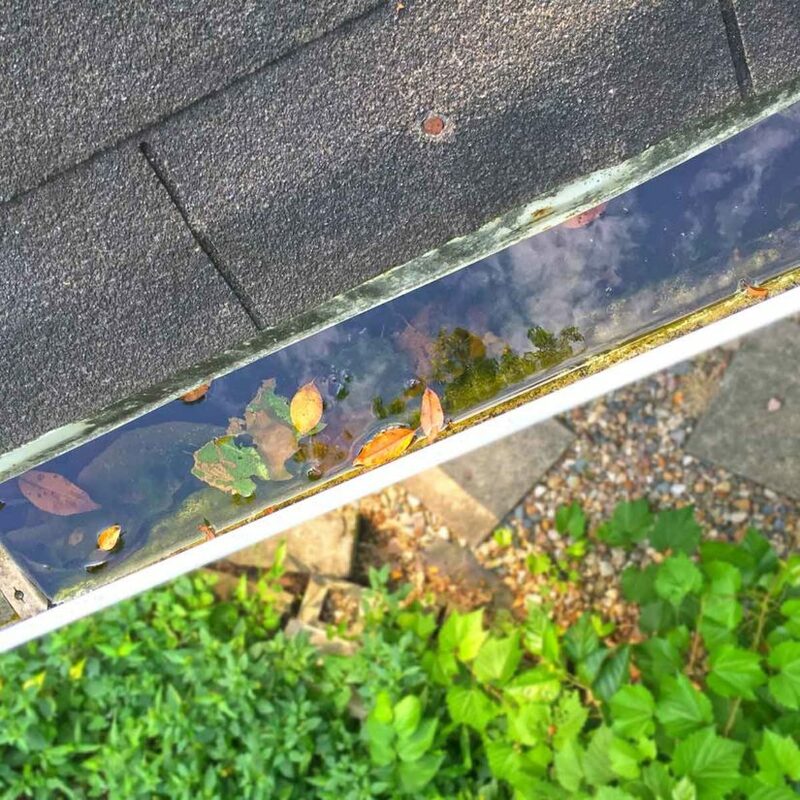 Can Clogged Gutters Cause a Roof Leak? The answer is a resounding Yes! When you allow your gutter to go unchecked, with no maintenance and debris removal through the seasons, you could be causing your own problems with roof leaks. Roof leaks can pose a threat to the structure of your home, plus they can be quite costly to fix. Avoid them in the first place by using clog-free gutter systems. A clogged gutter can cause major damage if left unattended. If you do nothing to keep debris out of your gutters, you’re essentially allowing your roof line to be a catch-all for every pine needle, acorn, twig and leaf that falls off the surrounding trees. While much of that stuff gets washed away with the rainwater, some stays, and when you add a poorly-flowing gutter to the mix, you can build up even more accumulation than normal. When blocked, gutters will hold in all the water and debris, pinning it against the edge of the roof. That excessive moisture gets under the shingles and eaves, causing rotting beneath. All that debris adds to the shade, which causes even more rot due to dampness, and thus the cycle continues. Even if you don’t have trees around your home, snow and ice can do a lot of damage too. When water freezes, it expands, filling the gutter and creating an ice dam that keeps rain and snow from properly diverting from the house. Where else does the water have to go then build up under the roof? This is why many people experience roof leaks in their attics first. As the first line of defense, not only should your roof be high in quality but your gutter system should be too. Installing clog-free gutters, or at least cleaning our your standard gutters regularly throughout the year, can do a lot in the way of avoiding costly leaks. First off, check for damage to the gutters themselves. Look for rusted-out spots, holes, and punctures where water can be getting through, and have them repaired or replaced. If you are experiencing leaks in your attic but can’t locate the source, stand back and take a look up at the roof. Are there any stains coming from uphill? If so, where do they begin? You may have to peel back some shingles to find the source near the gutter. Other things to look for include any roof penetrations that may be causing the problem, such as of course your gutters, but also plumbing and roof vents, chimneys, and dormers. It’s always best to have a roofer or gutter professional address any questionable areas rather than attempting them yourself. So, in answer to the original question: can clogged gutters cause roof leaks? The answer is yes. To learn how you can maintain clog-free gutters for your home, contact Home Solutions of Iowa.